Moammar Gadhafi is surrounded in Tripoli. 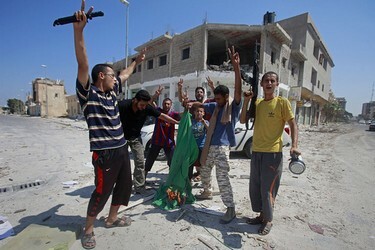 Over the weekend, rebel forces secured the town of Zawiyah, a strategically vital staging post 30 miles west of Tripoli, on the coastal road connecting the Libyan capital with Tunisia. Last Monday, the rebels took Garyan, which controls the highway leading south to Algeria. To the east lies Misrata, now also under the rebels’ control, and beyond that Benghazi and eastern Libya, which have been free of Gadhafi since February. To Tripoli’s north is the sea and an impenetrable maritime blockade. By almost any measure, Gadhafi’s days as “Leader and Guide of the Revolution of Libya” appear to be numbered. But with no exit strategy, regime diehards will see no choice but to keep on fighting, and rebel leaders privately admit that attempting a forceful takeover of Tripoli could prove disastrous. Fortunately, that is not their plan. Instead the rebels’ strategy has been to encourage a collapse of the regime from within, or at least a popular uprising in Tripoli itself that will force Colonel Gadhafi from power. Various media outlets were reporting yesterday that this uprising has now begun. Though some within the rebel ranks would like to see all vestiges of Gadhafi’s regime swept aside, leaders of the National Transitional Council in Benghazi are more pragmatic and are already working to prevent a security vaccuum. Their blueprint for a post-Gadhafi Libya, which was leaked to the Times of London this month, shows that the council has quietly recruited some 800 regime security officials, who are ready to form the backbone of a new government-security apparatus once Gadhafi falls. Likewise, the council plans to transfer some 5,000 policemen serving in units not ideologically committed to Gadhafi to the new government’s forces. Many other regime figures, exhausted and frightened, aren’t even seeking to hang on to power, but only want safety for themselves and their families. So far the strategy seems to be working. On Friday former Libyan Prime Minister Abdessalam Jalloud, who helped bring Gadhafi to power, defected and fled to Italy. Also last week, Interior Minister Nassr al-Mabrouk Abdullah and long-time Gadhafi ally and Libyan army commander Massoud Abdelhafid both fled to Egypt. The week before, Wissam Miland, a captured colonel being held by rebels as a prisoner of war in Misrata, told Agence France-Presse that his former master is holding his embattled military together through mercenary-enforced martial law. Read more in The Wall Street Journal.